1 - Try to confine the bat to as small a room as possible. Preferrably one with windows or a door. You can then open the window(s) or door, and there's a good chance the bat will eventually fly out. Worried that another bat might fly in? Ridiculous. What are the odds? 2 - If it can't fly out on its own, just sit around watching it. It won't attack you. Wait for it to land. Then drape a towel or other cloth over it, and wrap it up, and bring it outside and let it go. 3 - You can also put a plastic container over the bat once it's landed, and then slide a sheet of paper between the plastic and wall/floor, and take the bat outside. 4 - Don't bother trying to get it on the wing, with a net or tennis racket. This is very difficult, will likely injure the bat, and might result in you actually getting attacked. Just wait for it to land. If you have a colony of bats living inside your house, that's a whole different matter. Read my Bats in the attic page for instructions on how to remove a large group of bats living in the house. How to get bats out of a house - Have you ever laid in your bed at night and heard the pitter patter of tiny wings, or thumping sounding as though it is coming from your attic? If you had said yes to that question, there is a good chance that you could have tiny little bats renting out the upper layer of your home. The good news is that you can successfully eliminate bats from your attic with some knowledge and education on such a topic. The bad news is that it is going to take time and effort, and you may want to reevaluate your decision to do this yourself, and call on the help of a wildlife control professional or company instead. One of the first things that you are going to need to figure out is what your wildlife/pest problem is. It could be a bat, it would be a squirrel; in fact it could be any number of creatures. Thankfully, there are a few distinct tell-tale signs that your problem is due to bats. Bat droppings are different from other creatures. Firstly, they will disintegrate like chalk when handled. It is obviously advisable to wear gloves if you are deciding to test in this manner! 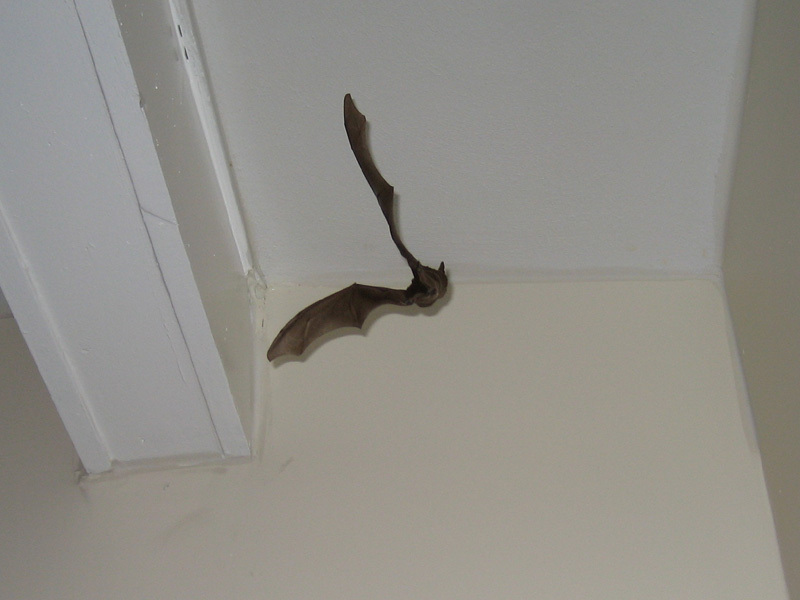 You will spot bat droppings all over the area that you think they are living in – usually all over the floor and walls. Secondly, you will notice that there are bits of undigested bugs still in the poop. Look around the outside of where you think the bats might be getting in. If you can see a slight brown color around any holes in the foundations of your home, it could be caused the brown staining of the bats fur. This is usually a very big indication that you have a rather large problem, or at least one that has been going on for some time. As a general rule, you are not likely to see that bats. That is unless it is balmy warm weather outside and you are looking around sunset or sunrise. This is when they will leave and enter your home in order to find food and do that flying thing they are so good at. Now you must figure out how the little blighters are getting into your home. Obviously there is a little hole somewhere – there must be, otherwise they wouldn't be able to get in. They only need the smallest of holes to crawl through – some bats can get through a hole that is less than an inch square, so you can understand why you might miss the tiny gaps. This is why you should try to use a wildlife control company where possible – they will be able to spot the things that you cannot. Especially when it comes to criticizing your own home. Obviously, you are going to need to seal these gaps. You should do this will all of the holes that you come across, aside from one main one. This is the one that you are going to encourage the creatures out by. Then, after dark when it looks as if they are all out feeding, go back and seal up the hole, preventing them from getting back in again. This all takes time, and it may even take a couple of season before you manage it completely. This is why a professional company is the best idea for this type of infestation. Go back to the main Bat Removal page for more information about bats in your house. How do you get a bat out of your home? What to do if you have bats in your house. If you discover a bat inside your kitchen or some other room, keep in mind that it would likely prefer to be elsewhere just as much as you'd like to see it gone. It's not going to hurt you; it probably flew in by accident and is probably just trying to stay out of the way. The bat will probably find its way out the same way it got in – through an open door or window, so your first strategy should be just to make sure that an exit is available and that access to other rooms is closed off. Then you wait. By night-fall it will be hungry and ready to go out to dinner as well as to rejoin its community. Dim or turn off the lights in the room where you've confined the bat and make sure an unscreened window is open. Leave the bat alone in the room so it has a chance to locate the open window and fly out on its own. After a few hours, survey the room to be sure it's gone – not just where you initially spotted it but also in the folds of curtains, behind pictures and in protected low places such as under occasional tables. Be sure to wear gloves during the capture and release process; bats' teeth are sharp and their feet have strong claws that they use to grasp their roost while they sleep. Bats have a delicate skeletal structure that's easily damaged so when handling them, be gentle. For the same reason, don't try to capture them in flight; they're amazingly maneuverable and netting them or grabbing them manually could easily cause serious injuries. Finally, keep in mind that while they make unwelcome houseguests, bats are not vermin. They roost and fly in clouds, or colonies, often several hundred strong, serving an extremely beneficial purpose. Each bat can consume several hundred mosquitoes or other flying pests per flight, several flights per night. They can't do it hanging on your curtain, so help them find a safe way back to nature. Go back to the main Bat Removal page for more information about Bats in the House.